Hi, Felix Bazgan here to discuss one of the most important aspects of food safety: hand-washing. Hand-washing in the single most effect means of preventing the spread of bacteria and viruses which can cause infections and foodborne illness. A few instances where hand-washing should take place are: before starting to work with food, utensils, or equipment; during food preparation as need; when switching between raw foods and ready-to-eat-foods; after handling soiled utensils and equipment; and of course after coughing, sneezing, eating, drinking, or using the restroom. In a typical commercial kitchen, this should be standard practice. However, what happens when you are catering off site, or prepping and serving meals at a location without running water or electricity? Here's where the Cambro hand-wash station is the perfect solution. This hand wash station sets up quickly and easily in any environment and uses something most of you already have: the Cambro camtainer. There are four components to the hand wash station. First, you'll need a two-and-a-half gallon or five-gallon camtainer, or ultra-camtainer. Next, the hand-washer accessory, which easily attaches to the camtainer, and using "hand-wash only" labels and easy-serve dispenser, turns a camtainer from a beverage dispenser to a convenient and economical way to meet health department hand-washing requirements. The Velcro strap quickly and easily secures the hand-wash accessory to the camtainer. The third component is a camtainer riser, which increases the use of the hand-wash station. Finally, the Cambro five-and-a-half gallon pail makes for a safe disposal of waste water. The two hand-wash models Cambro offers both have a soap dispenser and are available with a paper towel roll holder or multi-fold paper towel dispenser. See how easy it is to meet Health Department Hand Washing requirements by turning your Cambro Camtainer into the Cambro HWAPR Handwash Station. By turning a beverage dispenser into a handwashing station when necessary, you're saving time and money! Can I pre-heat or pre-chill this Camtainer? Yes. It is recommended that users either pre-heat or pre-chill their dispenser for maximum efficiency and to ensure the longest possible temperature retention. Simply fill with hot or cold water, cover, and latch the lid for 15-30 minutes prior to service. Is this Camtainer dishwasher safe? Yes, this item can be run through a dishwasher. However, the right cleaning materials must be used and certain procedures must be followed. Please consult the Cleaning Instructions for additional details. 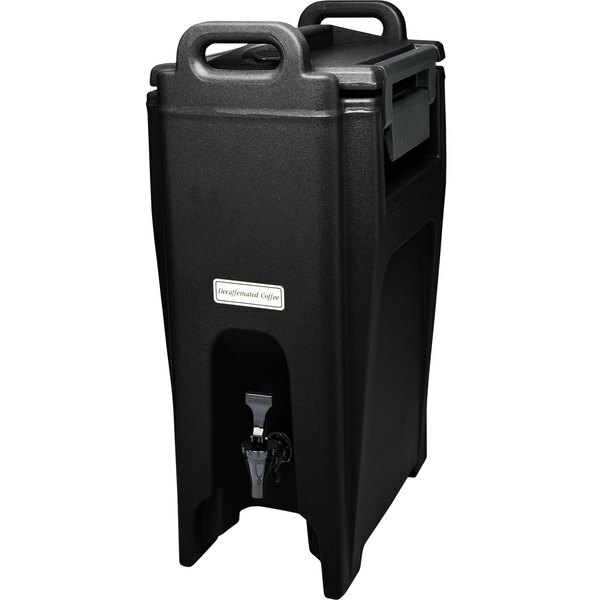 For reliable hot or cold beverage holding, transport, and service, look no further than this Cambro UC500110 Ultra Camtainer 5.25 gallon insulated beverage dispenser. In addition to attractive black coloring and a stylish, versatile design, the unit's 5.25 gallon capacity can serve up to (96) 7 oz. cups of coffee, tea, or water. It features single-molded, seamless polyethylene construction with a textured exterior that's designed to resist scratches, dings, and dents. Interior foam insulation and a nylon over-center latch provide outstanding temperature retention for up to 4 hours a time, ensuring that your hot beverages remain hot during the entirety of your event. Plus, a large drip-proof recessed spigot ensures convenient access for all your guests and patrons. In order to conveniently refill both before or during service, an integrated vent cap equalizes pressure to release steam and make it easier to open the container. Thanks to EZ-grip molded handles and a raised edge, spill-proof lid that prevents leaks, each Camtainer offers effortless transport from one location to the next. 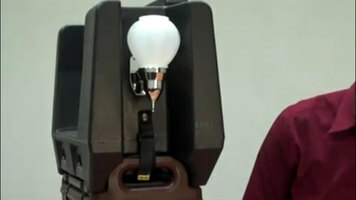 No electricity is required for operation, and no assembly is needed to prepare this unit for convenient service. A set of self-adhesive beverage labels are also included for quick identification of your most popular drinks. Perfect for any catered event, concession stand, or banquet, this durable dispenser enhances any beverage service with remarkable ease. Keeps Coffee hot for hours!!! Whenever we do catering events we are surprised on how long the brewed coffee stays hot for. Great hours later. LOVE LOVE LOVE! It is easy to use but cambro itself is too heavy. It was heavier than I thought. However, as far as heating coffee was last longer than I thought. The Camtainer Ultra Camtainer 5.25 Gallon Black Insulated Beverage Dispenser is well made and sturdy. It can easily be transported to any catering event and it is very well insulated. It is great for any catering event.